Several years ago, I met the sweetest boy in Roggie. His round face beamed at me and even though he spoke not a word of English, I instantly feel in love with his shining smile and bright brown eyes. His name is Temam,and for the last several years, my family and I have sponsored him to go to school. Over the years, I have prayed diligently for this boy whom I all too easily began to think of as my Ethiopian son. I prayed for the normal things a parent might pray for – health protection, academic success, good moral behavior, but with fervor, I prayed, even though he is being raised in a Muslim family, that he would come to know Jesus as his Savior. Like the seed sower in Mark 4:26-29, I scattered these prayers and hoped they would grow. During my return trips, I spent time with Temam visiting his family, hugging him and encouraging him. I scattered more seeds ones that God had already grown in me – I love you. You have value to me. God has a purpose for your life. As I prepared the Bible story program for our mission trip this year, I thought more about Temam. What would he think about the stories in Genesis? Would they land in soft fertile soil, or would his heart be hard? Would he respond when the team told him how all of Genesis points to our loving Savior Jesus? I wondered about this seeds I was preparing. Would they bring a harvest? During our time in Roggie, I began to see a change in Temam. He sought me out everyday just to hug me and hold my hand. His smile, while still so sweet, was radiant. I could tell that God was making the fertile ground of his heart ready. On the last day a group of teachers and Americans were together looking over a paper. It was a list of names of children that had accepted Christ that very morning. The second name on the list was my Ethiopian son, Temam. God had taken these seeds I had faithfully sowed, grown them, and the harvest was ripe. I, of course, had only one response, tears of pure joy. I prayed with Temam, and I got to sow I new seed in him. I told him I am his spiritual mother, and someday we will walk into eternity together to see Jesus face to face. I don’t really know what he said to his Muslim family when he got home that day, nor how God gave him the courage to attend the Christian church without them, but that Sunday Temam was at church. Radiant. Many seeds were planted over the week by our team, and while my heart always longs to be in Roggie, I know God can care for His garden even when we are not there. I pray that when we return again that the crops will once again be ready for harvest. What a privilege it is to be a seed sower for the King of Kings! The landscape around Roggie was covered with acacia trees, small elongated oval leaves draped over a dark multi-stemmed trunk and covered with sharp three inch thorns. When I asked one of the students what kind of tree it was, he replied, “a fighting tree.” The symbol on the flag of the Oromo people is probably an acacia or sycamore-fig, but at the time I could find no one who knew for sure. As I approached a large cluster of students that first morning they seemed like a collection of acacia trees dotted with an occasional sycamore-fig. They were small, slender and beautiful with defined faces like those that splash across the pages of a fashion magazine. These children also had a fierce gaze, which they did not break until I summoned up some courage and smiled at them. Instantly they broke into warm and heartfelt grins, that sent a wave of relief over me. A hands-on-science experiment for classes of 75-100 students was a daunting prospect, but my fearless leader Deb had reassured me that their English was pretty good and that these children were not like American children, they knew how to behave in a class room. So after the camera crew team took pictures of all 500 students the first day, and having the job of pointing them to the next free camera station and feeling the shy warmth of 500 eager faces, I felt like I had established some friendships. The next day after a hearty Ethiopian breakfast, prayer, and a flag ceremony, in which I studied the tree on their flag wondering what kind of tree it was, I headed off for our first science investigation with the seventh graders. I was pretty confident that these students were different, and when I entered a small classroom with 75 students, I was a little shocked at how familiar it felt. They were talking among themselves and the warm shy smiles of the day before were gone. The translators and teachers were not quite there yet and my English made no more of an impression than a murmur of amusement. My explanation of what we were going to do that morning was met with quizzical stares. Then to my relief their teacher and the pastor came in and things quickly started to change. We experimented with magnets and I showed them how they worked in speakers. Then I explained how magnets could be made smaller and smaller till they were invisible, like a ferro-fluid;, a nano sized particle solution found inside of a ear bud headphone. I wanted to get them thinking about things we cannot see and understanding the force around magnets seemed like a good place to start. They liked seeing for themselves, just like my American students, how as a magnet approached what looked like a dirt oil, the oil suddenly came alive as the liquid conformed to the magnetic field lines and looked like the hair on a cartoon character with a buzz cut. As I explained all this, pastor Matheows translated and 2-3 teachers walked around the classroom making sure everyone had a chance to use some magnets and understood the lesson. We did similar experiments for the other two classes. What might have seemed impossible was made possible by the hard work of the teachers as they took my teaching and lit up the faces of the students with comprehension. The next day Alisa and I did a chromatography experiment in which we separated out the different pigments or forms of chlorophyll in plants. We used a strip of coffee filter paper placed with just the tip touching the alcohol solution at the bottom of a cup and then relied on capillary action of the alcohol moving up the filter paper and dragging the pigments with it. They moved up at different rates depending on the attraction of the filter paper and the pigment. To warm up with the technique we used different colored water soluble markers and separated their pigments using the capillary action of water. The students were very interested and liked the hands on applications of science. And I was so pleased at the students ability to drape themselves on one another in a way that allowed everyone to see and hear. It gave us time to focus a little on the students who looked bored to see if we could encourage their participation. It was a wonderful feeling of unity where we were all working for a common goal and the peace of God settled across the room like a warm blanket on a rainy day. The next day we were discussing the tower of Babel in Genesis and the eventual destruction of our common language. We read the story and then talked about how to build a tall tower out of spaghetti and marshmallows. Ben pointed out how a triangle made a strong foundation and we talked about how it was important to start with a firm foundation in their spiritual life also. Then we gave them about twenty minutes to build the tallest tower. Happily the seventh graders built the tallest towers of all the grades, and yet everyone learned something about construction. The final day was the most challenging as we had balloons and wool and silk to make static electricity, but it was humid and that hindered the process, we tried constructing a battery out of potatoes to light up a small 1-2 Volt LED, but at last we gave up; not being able to find some hidden short in the circuitry. We did show them how their solar panel on their library roof works only in the presence of sunlight with a small solar panel and they all loved that. Then Ben, our resident engineer explained a circuit diagram and how resistance and current flow and voltage are all related. Even the teachers were listening intently to his discussion. We all walked away with a good metaphor for potential and resistance using water flow through different sized holes at the bottom of a cup to represent different size resistors and the height of the bottle of water as the voltage potential of electricity as current flows around a circuit. I hope that we introduce the world of cell phones and electricity which is so foreign to them, but is entering into their world rapidly. And also introduced the invisible nature of God and how he developed science not to replace himself but to guide our understanding of who he is in all his gloriousness: united and yet made up of parts which work together like in a fighting tree or sycamore-fig, giving glory to its creator. And as we begin to understand all these different parts and how they function together, we begin to more deeply understand the infinite wisdom of a compassionate and loving father. Some people might describe Ethiopia as a hopeless place. As I looked around at the faces, I saw hope. Despite the extreme poverty and heartbreak, the love they show for Christ and others has deeply touched me. The Lord is doing a mighty work amongst his people. This is what this life is truly about. Arriving back from Ethiopia, cell phones suddenly woke up and familiar sounds filled the air. I think of the moments when my team prayed…when the world faded away and Jesus rushed in. As I got off the plane I notice how sterile the environment looked compared to what I had left. Neatly dressed business men and women rushed through the airport and I thought of the woman sitting on the curbside by the busy street in tattered clothing with her baby sleeping beside her, on a piece of cloth that was laid on the cement. As I reach the highway, my mind went back to the mud roads that covered the villages. I pass by a school with children getting out, parents lining the streets and I remember the children roaming the streets and villages, possibly not able to go to school because of money they don’t have. I think of the Roggie kids who are able to attend school because of help from sponsors. They count it a joy and privilege to put on their school uniforms to walk a dirt path to be able to attend school. We drive past a church and I think of Sunday mornings when people attend worship despite possibly not having all of their needs met but still seeking the heart of God and passing out gifts and food out of respect for us. I think of Samuel who heard the Gospel and received Christ. He was rescued and redeemed and now disciples others despite knowing the pain of having his Muslim family reject him. I wonder if others will understand my experience. My world collides. The ache comes in the worlds colliding, a longing for all to be connected. It is about sharing Jesus. What am I to do in the longing, the feelings between there and here? How do I answer the questions or understand the passivity of the responses? Allow the worlds to collide. Love with all my being wherever I am. Give generously and willingly. Open eyes to see what Jesus sees. Whether its the needs of a child living among the deepest poverty or my family and friends. Love both with all my heart. As I love, somehow, the worlds collide. The Spirit of the Lord is among us. There is no variation in giving here or there….simply giving…and in turn receiving Jesus. The sadness sometimes felt after is normal. We were warned. It should propel me faster to the things of God and a deeper dependence on Him. Release of the ache should come as I raise my hands in thanksgiving for each breath I take. As I take notice of the moments that occupies my time. I can do all things in Christ and allow Him to invade my world, wherever I am. It is in the going to a place such as Ethiopia and doing something that more than exceeds my experiences. The Jesus I encountered this week was more than I can put into a blog post. Jesus is as much on display now in conversations, laughter and hugs. The worlds collide as I hear about others week and I seek after their hearts and reach into their world so they will know Jesus more just as we sought after the hearts of the Ethiopians, that they would know that they are loved by us and Jesus. I need to lean in tighter and allow what happened to continue to motivate how I live. Allow the worlds to collide. Allow God to continue to prove faithful as I walk the path He has laid out for me. I am created by God and for God for His purpose. 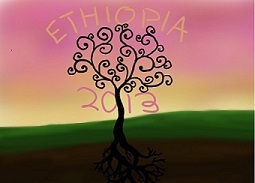 Before our team traveled to Ethiopia, God put on my heart to pray with fervor for our trip. At the end of our week in Roggie, I reflected on the list of things I had been praying for and was in awe at how God had answered each prayer. As I shared with our team and friends in Ethiopia my prayer list, they also were astonished. 1. Revival – I prayed for revival in Roggie. When I was praying, I imagined a revival meeting like those I have seen in movies complete with a tent and a preacher calling people to the altar. I have never been to one personally, but this was the image God gave me in prayer. Saturday morning in Roggie we were invited to participate in a revival meeting complete with a tent and an altar call. And unbelievably, God called me to be the guest preacher. 2. An elder in the community to come to Christ – At that revival meeting, an 80 year old man accepted Christ as his personal Savior along with nine other people. 3. A pastor to love this community – God sent us a translator that serves as a teaching pastor in a large church in Arsi Nigelle, the closest urban area to Roggie. He grew up near Roggie and loves this community and has promised to pray and care for them. 4. For the children to love the Word of God- two gifted Bible teachers, Kathy and Deb, taught the older children how to study the Bible and how to love God’s word. The younger children heard Bible stories and participated in fun projects. 5. For us to know the fullness of His love – I think every person on our team, the school staff and the many friends we have made in Ethiopia experienced the deep, full love of Christ these past two weeks. One thing I thought was so awesome was we had two younger team members that wanted to see animals. We told them we have only seen livestock in the past, but this trip God put more animals in our path than ever – monkeys, baboons, warthogs, storks, ostriches and flamingos just to name a few. God loves us so much He delights in the details. 6. Miracles – Every answered prayer, 49 children confessing Jesus Christ is their Savior and for me personally, my sponsor child Temam who comes from a Muslim family accepting Christ as his Savior, miracle after miracle took place. All glory to God who is an AWESOME God who reigns over Heaven and Earth. The day began with Heidi leading our daily devotional from Romans 12:1-5. Genesis 6:22 and Luke 5:4 translated by Pastor Matthews in Oromiffa. The passages capture the need to be united in one voice and one body while we serve our Lord not only through the teachings of the day but the interactions with one another. Then we were off to the required and very much sacred flag ceremony where we were greeted with warm smiles from approximately 450 children ranging in age from kindergarten to seventh grade eager to start the day. The sound of children’s voices in song and prayer rose above the breeze and rooster’s call with African joy. Liv summoned the students to simulate the sound of a rain storming coming and going. The students were asked to emulate her movements with simple yet consistent hand gestures. The storm slowly moved in and then dissipated back to where it had come with snapping fingers, sliding palms and stomping of the earth. The application behind the message was to show that God brought rain during the time of Noah as well as God’s promise not to let it rain so significantly again. We were then ready to start the day with the teachings of Noah and the Ark. Upon the conclusion of our teaching day, we had a walk through the village filled with life moments. We meandered through the fields and paths collecting curious children along the way. We were one line of people in a steady forward march, ready to visit old friends and sponsor families. Our first stop was an old friend from previous trips, and we all received the most genuine hug, the kind that gives that extra moment of appreciation. As we came around the next bend, to our surprise, we were met by a freshly born goat, so recent in fact that the umbilical cord was still attached. Needless it say, it made for some great photos. It was as if the paparazzi had invaded Africa. Our first day of teaching was filled with puppets, paints, a science experiment and preaching God’s word. We began our day with song, led by Aman, a truly gifted Ethiopian teacher. Eighty-five children sang and clapped enthusiastically while sitting four to a bench. Aman then shared the story of Cain and Abel. The kids listened and participated intently while bravely sharing their heart during the application questions. Next was the puppet show that Heidi had put together to further illustrate the lesson of the day. Sue brought in a traveling science , demonstrating “chromotogrophy” and how everything whole is actually made up of smaller parts- or in this case, separate colors. Finally, grades 3 and 4 began their week-long art project. The intent was to have the children begin a multiple day mural based on Christian artist Edward Hicks’ interpretation of Noah’s ark, starting with the ark and landscape. Each team had a large paper to paint an ark and smaller papers for flowers, trees, clouds and earth with each day becoming a layer of the mural and ending with a collaborative rainbow. The sweet third and fourth graders heard the word “ark” and began painting rainbows. Once the rainbows began, you really couldn’t (or wouldn’t want to) stop the flow. The third and fourth grade class began with God’s promise- what an optimistic group. Upon completion of our day, we found ourselves with a few minutes to fill while waiting for the lunch line to die down. It turns out that in Ethiopia- when you find yourself with a spare moment….try singing a song! Upon suggestion, eyes lit up, backs straightened and singing in Oromofo began. Our room was filled with contagious joy. The principal of the school came in, along with Tegabu and his guitar. You never would have guessed that nearly 100 children were waiting to eat. Who needs lunch, when you have song? In the morning we had a nice breakfast prepared by our gracious hostess, Stagay, at the Providence Guest House. For those of us who had not been to Ethiopia before, the morning light gave the first glimpses onto the street, where people could be seen walking and the city unfolded with it’s mixture of cement buildings and those made of tin or whatever can be found. Some of our team went out for the first half of the day to purchase a few forgotten items and some supplies we had planned to get in Addis. We were surprised to find that it took 3 hours to purchase some basic medical supplies we were to take to Roggie Village. This is Ethiopia. What we could have picked up in 15 minutes at Target, took 3 hours of discussion and conversation, debate, recounting, and justification. Things are slower here. We are on Ethiopian time. We took our photo in front of the guest house and loaded the bus up for our drive to Lake Sabana. The bus was pelted by rain for much of our 5 hour drive. We watched as the dirt ditches on the sides of the road filled with water and it looked as though the fields on either side of the vehicle would wash away in the flood. As we listened to the thunder, we wondered if we would be able to make the drive through the pothole-filled dirt road to Roggie Village the next day. “I hope so,” said Worede. We imagined the idea of carrying all of our heavy luggage through the mud if the bus got stuck, and we all laughed.